Breyer was probably referring to the lack of tough competition: as others have anecdotally judged, and we have assessed after studying all 1,100 incidents of laughter at the Court between 2010 and 2017, most humor at the Court would not muster the $50 traditionally paid by late-night shows for jokes. We saw in the last post that oral argument has become a lot funnier in the last four decades, yet even in that considerably more comedic era, being the “funniest justice” may still not be a title that anyone should aspire to—not only because the humor is mediocre, but because being number one is arguably a badge of dishonor. The reason is that what others have called the “funniest justice” scale looks very much like a scale of which justice is the most biased in their use of humor, as the next figure shows. On the left are the justices in the modern era who get the most laughs; on the right are the justices who show the greatest laughter disagreement gap—the tendency to make jokes during the time of an advocate whom they ultimately vote against. There is a pretty clear correlation between being the “funniest” and being the most biased on this scale. Five of the seven justices who most often inspire laughter—Justices Scalia, Breyer, Rehnquist, Kagan, and Souter—were the top five most biased in their use of humor against advocates they end up voting against. Not all of the so-called funniest justices are at the very top of the bias rankings, but all lie near the top in the broader historical rankings. Even less biased justices in modern terms, such as Chief Justice Roberts and Justice Gorsuch, who were third and fifth on laughs but ranked lower on the laughter bias ranking, still leave all of the justices serving in the early era far behind in terms of bias. As we showed in our last post on this topic, laughter at the Court has significantly changed in the last four decades, increasing dramatically at the same time as the Court became more performative more generally. But that dramatic increase was not simply a product of a change in personnel: as we show in our comprehensive new study, Taking Laughter Seriously at the Supreme Court, forthcoming in Vanderbilt Law Review, the increase in laughter at the Court also stems from changes in the behavior of existing personnel. The next figure shows the rate of laughter for each justice on the Rehnquist and Roberts Courts, from the 1970s until the 2017 Term. Of all the justices who were on the Court in this Century, it is the three with consistently low levels of laughter who are the outliers. Justice Thomas’ almost-zero level of laughter inducing episodes is unsurprising, since he barely speaks and, so, rarely gets a laugh. The other two low fliers appear to be Justice O’Connor and Justice Ginsburg, but both are only low on the humor scale compared to their modern contemporaries—when compared to all of the justices serving since 1955, Justice Ginsburg is in the top half and Justice O’Connor is very close to the top half. Many of the other justices display an upward trend in their laughter inducing behavior. For instance, Justice Scalia, who is said to have changed oral argument when he entered the Court, actually spent his first two years getting few laughs, then had a clear consistent upward trajectory, more than doubling his laughs per argument in his later career. Similarly, coming in at number two overall, Justice Breyer also started off much lower on the laugh scale, as did Justice Stevens, Justice Kagan, Justice Alito, and Chief Justice Rehnquist—until he had a sharp drop off prior to his death. The differences between the modern justices and the earlier justices, as well as the change within individual justices’ behavior over time, shows that laughter at the Court has changed dramatically in the modern era and strongly suggests that the shift on the Court is not simply due to personnel changes. As we have argued comprehensively elsewhere, the development of oral argument into more of a performance not only coincides with the politically polarized post-1995 period, but the level of political polarization predicts various performance behaviors, such as the justices making more comments than asking questions, interrupting, and talking more. Laughter fits that pattern too: at least in part, courtroom humor is an element of advocacy, and as we have shown, it is directed at weaker and inexperienced advocates with whom the justice tends to disagree. Laughter, in short, is a weapon, and the funniest justice is the most vicious. Justice Breyer: I see the point. You can go back to, go back to Justice Kagan. Don’t forget her question. Mr. Carvin: –I — I was facing the same dilemma, Justice Kagan. But even when the justices are being ostensibly self-deprecating, such as here, there is often a sharper point beneath the surface of comments—Kagan was simultaneously making a joke at her own expense and at the expense of her senior colleagues, calling attention to their tendency to interrupt her. Last week we discussed some of the data on laughter at the Supreme Court in a new empirical study that is now forthcoming in Vanderbilt Law Review, Taking Laughter Seriously at the Supreme Court. We showed that the justices use courtroom humor as part of advocacy—the individual justices are far more likely to make jokes while speaking to the advocates they ultimately vote against. In addition to using text mining to analyze over 9,000 occurrences of laughter at oral argument since 1955, we also did things the old fashioned way and read about 1,000 instances of judicial humor between 2010 and 2017. What we found, in a nutshell, was that judicial humor at the Supreme Court is often very much about dominance and hierarchy. Breyer and Kagan are actually quite a contrast to the rest of the Court in their repeated willingness to make jokes at their own expense. Although our reading of transcripts is obviously subjective, the data backs up our impression that the justices use courtroom humor to emphasize the weakness of the advocates. One of the few prior studies to try to empirically examine humor at the Court claims thatlaughter is primarily used as an equalizing force, a means to foster a de facto egalitarian environment despite the structured hierarchical nature of the Court. We debunk that claim. In fact, the data shows that the justices most often use courtroom humor against an advocate who is losing the argument (see the figure below), and against inexperienced advocates. Just like the President, who “likes people who don’t get captured,” the Supreme Court justices like people who are winning, and like to make fun of advocates who are losing. The figure below shows the net difference in laughter for each justice in terms of whether the advocate ultimately won or lost the case. Almost all of the justices on the Court in the last 20 years tend to use courtroom humor significantly more during the time of the losing advocate (represented by the solid black bars to the left of zero). We see a similar pattern for experience. The justices employ courtroom humor significantly more against inexperienced advocates. Since 1955, advocates making their first appearance before the Court endured the justices’ wit at a rate of .55 episodes per appearance. That figure drops to just over .40 for advocates with less than ten arguments under their belt, and to a mere .19 for the elite lawyers appearing for at least their eleventh time. These differences are just the tip of the iceberg. Further examination shows that there is a significant interaction between advocate experience, laughter, and both individual justice’s votes and overall Court win-loss differentials. We go into these issues in much more detail in Taking Laughter Seriously at the Supreme Court, but the bottom line is that laughter at the Court is not really about mirth, wit, or levity; the justices use courtroom humor as a tool of advocacy and to reinforce the hierarchy between the winners and loser and the experienced and inexperienced. More often, however, the justices are making a very deliberate point in their use of humor, beyond mere witticisms. For instance, in deciding whether a law sanctioning a baker for his refusal to make a wedding cake for a gay couple was contrary to the First Amendment, in Masterpiece Cakeshop v. Colorado Civil Rights Commission, Petitioner’s advocate Kristen Waggoner argued that there is speech value in making a cake, but tried to limit the Court’s concern about the slippery slope of other applications. Justice Kagan asked why there isn’t the same protection for a makeup artist, saying “It’s called an artist. It’s the makeup artist. (Laughter. )” Kagan was posing the serious question of how such claims could be limited by asking the seemingly absurd question of why hairstylists and others should not command the same respect. Justice Breyer made a similar point about the potentially limitless distinctions the Court would be asked to make if it ruled in favor of the baker by resorting to the hyperbole of the Court deciding “42,000 cases, [one for] each kind of vegetable — (Laughter. )” Justice Gorsuch, on the other hand, emphasized that wedding cakes are not made or consumed for the taste but for their symbolism and artistry, by joking that “I have yet to have a . . . wedding cake that I would say tastes great. (Laughter. )” It is unsurprising that Gorsuch voted for much stronger protection for the baker than Kagan’s concurring opinion, joined by Breyer. The latter set of examples are part of a broad pattern that we identify in a new study, Taking Laughter Seriously at the Supreme Court, forthcoming in Vanderbilt Law Review. We analyze every instance of laughter from 1995 until the 2017 Term—9,000 instances of laughter witnessed at the Court in 6,864 cases, over 63 years—and also qualitatively individually assess all 1,061 episodes occurring between 2010 and 2017. Until now, laughter at the Court has been examined by looking at individual Terms, with the results analyzed in terms of which justice is the funniest. We show that when the justices employ courtroom humor it’s no randomly frivolity and it is usually not even especially funny; rather, laughter is used by the justices as a weapon of advocacy. We have shown previouslythat the justices strategically use up the time of advocates arguing positions that they ultimately vote against, interrupt those advocates more than their counterparts on the other side, and direct more questions to advocates they favor and more comments to advocates they disfavor. We argue this constitutes a new level of advocacy by the justices on the contemporary Court. In the same vein, we show in our new study that the justices most often use courtroom humor when they will eventually vote against the side the advocate is representing. The figure below shows this laughter differential. Just as we have shown that judicial advocacy is reflected in the “disagreement gap”—that on average the justices have much more to say during oral argument to the party they ultimately vote against—there is also a “laughter gap,” with the justices making more jokes during the time of the advocate they ultimately rule against. The figure below shows the proportion of instances of laughter for each justice of the modern Court, depending on whether the justice ultimately agrees or disagrees with the advocate. In regression analysis in the article, we show that the effect of the justices who are “biased” in their use of humor significantly outweighs those justices who are “neutral,” even when looking at the whole period of the modern Court, including the less boisterous Burger and Warren Courts. For the most part, the justices use courtroom humor intentionally and strategically. This is apparent from the content of some of their jokes, and it also apparent in the broader trends in the data. In this post we have focused on how the incidence of judicial humor falls overwhelming on the advocates the individual justices disagree with. In a future post we will address other insights we derived from the data. Hint: Almost always, and definitely when it’s 40-feet-tall! The Establishment Clause expressly prohibits the State from making any “law respecting an establishment of religion.” Yet, for decades, the Supreme Court has applied this particular limit on government power only selectively and half-heartedly. On the facts, it seems obvious that a 40-foot-tall stone and concrete cross set astride a traffic median by the State of Maryland is, first and foremost, a religious display by the State. It is equally obvious that the decision to honor WWI veterans with this particular symbol is either pretextual or secondary to the religious symbolism of the Latin cross. Granted, a cross can be seen simply as a marker for the dead (although many find it exclusionary, and offensively so, in that context) but when the cross is 40-friggin-feet-tall, its predominant meaning is unmistakable. As clear as American Legion v. American Humanist Association might be on the facts, we suspect that in this particular area of constitutional law, facts matter a lot less than beliefs about the inherent legitimacy of Christian values and identity as universal American values and identity. The universalist claim is wrong in every possible way. The founders did not hold to it even when the population was overwhelmingly Christian, and there are now more non-Christians in America today than there are people in Thailand, the United Kingdom, France, or South Korea. Nonetheless, the fiction that symbols like the Latin cross and the Ten Commandments are simultaneously Christian and yet universal is an article of faith among many conservative Christians, and this almost certainly includes the five conservative Christian men who constitute the majority of the Supreme Court. 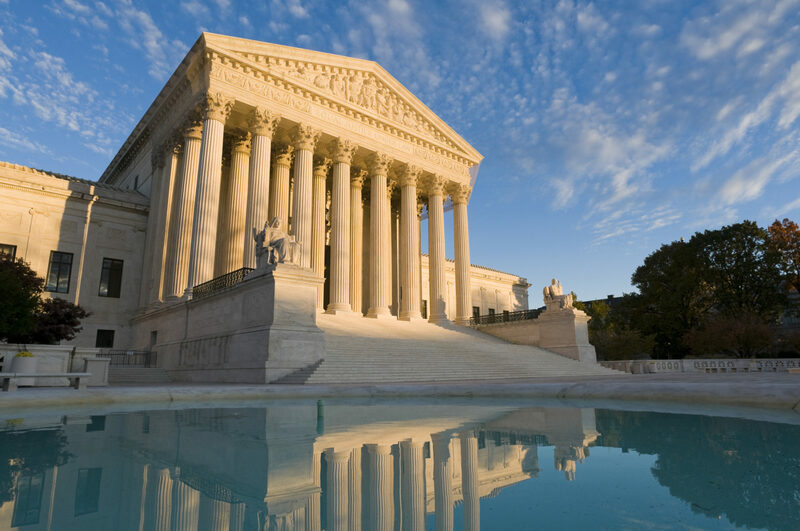 The Establishment Clause jurisprudence on questions such as the mandatory prayer readings and the display of religious monuments is inconsistent and unpredictable, but the justices themselves are not. Our predictive model, based solely on the oral argument, is almost exactly what you would expect. We see Justices Alito, Gorsuch, and Kavanaugh strongly in favor of the Petitioners (The American Legion and The Maryland-National Capital Park and Planning Commission), joined by Justice Breyer (consistent with his live-and-let-live concurrence in Van Orden v. Perry) and Chief Justice Roberts (who admittedly comes out as a toss-up on the numbers, but there seems little doubt where his sympathies were). The female justices of the Supreme Court, Justices Ginsburg, Kagan, and Sotomayor, seemed far more skeptical of the universalist assumption. It is probably no coincidence that Ginsburg and Kagan are Jewish and that Sotomayor is (in her own words) a wise Latina. For Petitioner: Alito, Gorsuch, Kavanaugh, Roberts, and Thomas. Breyer concurring.